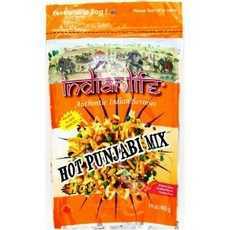 Enjoy Indianlife Hot Punjabi Mix. One Of Our Most Popular Snack Mix Product Made With Chick Pea Crisps, Legumes, Cashews, Peanuts And Other Things Is Hot And Tastes Fantastic. (Note: Description is informational only. Please refer to ingredients label on product prior to use and address any health questions to your Health Professional prior to use.